Casa Lago Mar - Key Colony Beach! Beautiful vacation home in the Florida Middle Keys! This exquisitely appointed 3 bedroom 2 full bath waterfront home is located in one of the Florida Middle Keys most desired areas. Your comfort and vacation enjoyment is our main goal and the amenities of our home will surely satisfy your vacation expectations. Key Colony Beach is surrounded by the Atlantic and the Gulf of Mexico, it has its own 9 hole golf course, tennis courts, jogging trails, bike paths, playgrounds & restaurants! Two bikes are at the house for your vacation use. Cabana Club privileges included where you can enjoy olympic size pool, hot tub and sandy beach. 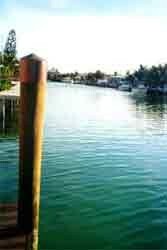 We are on a wide deep water canal, 50' wood dock with convenient boat rentals nearby. BBQ grill, fish cleaning station, hammock & much much more! Two bikes at house for your vacation use. Pool & hot tub at Cabana Club. Membership included in your rental. Key Colony Beach is surrounded by Atlantic & Gulf. Beach, water skiing and boating year roung all within walking distance! Great restaurants in Key Colony and also in driving distance in town of Marathon. One hour from Key West, two hours to Miami. Flexible with in and out days of the week. Discounts for multible weeks and months upon request. Cancellations and Refunds: According to rental agreement. Required Stay: Minimum one week rentals.